Distribution substation is a substation from which electric supply is distributed to the different users. In a substation there are numbers of incoming and outgoing circuits each having its isolator, circuit breaker, transformers etc. connected to bus-bar system. These equipment are mostly static type. The distribution transformer is a main and largest equipment of distribution substation. It is basically a static electrical device which steps down the primary voltage of 33kV or 11 kV to secondary distribution voltage of 415-440 volts between phases and 215 volts between phase and neutral through delta-star windings by electromagnetic induction without change in frequency. Transformer consists of the following parts and components. 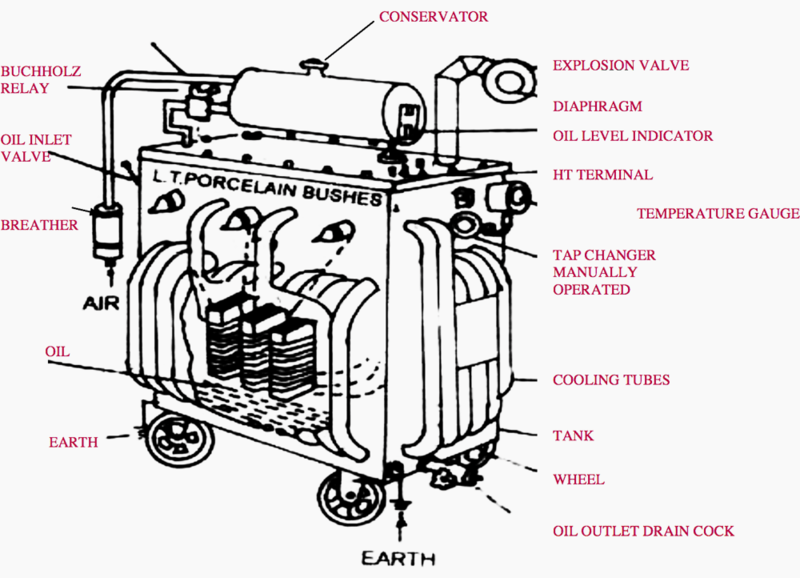 It is a drum containing transformer oil and mounted at the top of the transformer and connected to the main tank by a pipe. 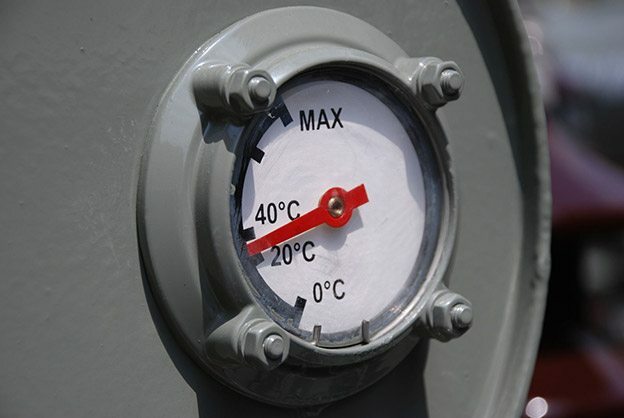 As the volume of oil of transformer tank expands and contracts according to heat produced, this expansion and contraction of oil causes the level of the oil in conservator to rise and fall. It is attached to conservator tank and contains silica gel, which prevents the moist air from entering into the tank during contraction of oil. When oil is hot there is expansion and gas passes to atmosphere through it. When oil is cooled, it contracts and the air enters in it. It prevents transformer oil from moisture contamination. 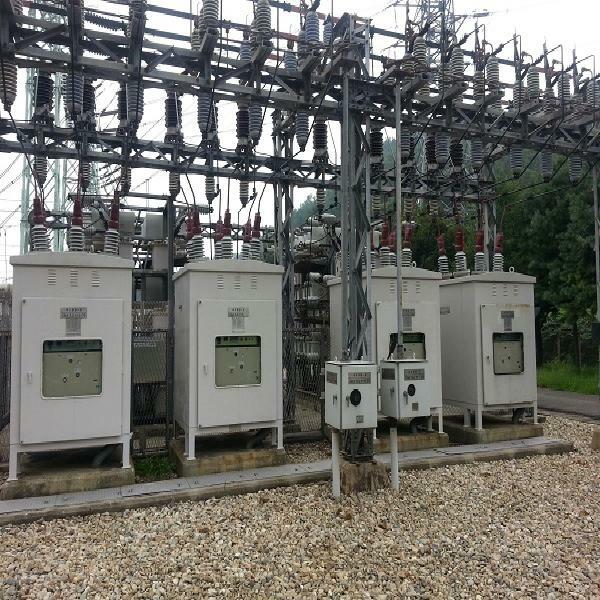 It is protective relay of transformer. This device signals the fault as soon as it occurs and cuts the transformer out of the circuit immediately. This is gas operated protective relay. It is installed in between the pipe connecting the tank and the conservator. This relay works on the formation of excessive oil vapors or gas inside the transformer tank due to internal fault of transformer. It consists of two operating floats A and B. These are operated by two mercury switches separately provided for each float. The float A is for bell alarm and float B is for operating the tripping circuit. 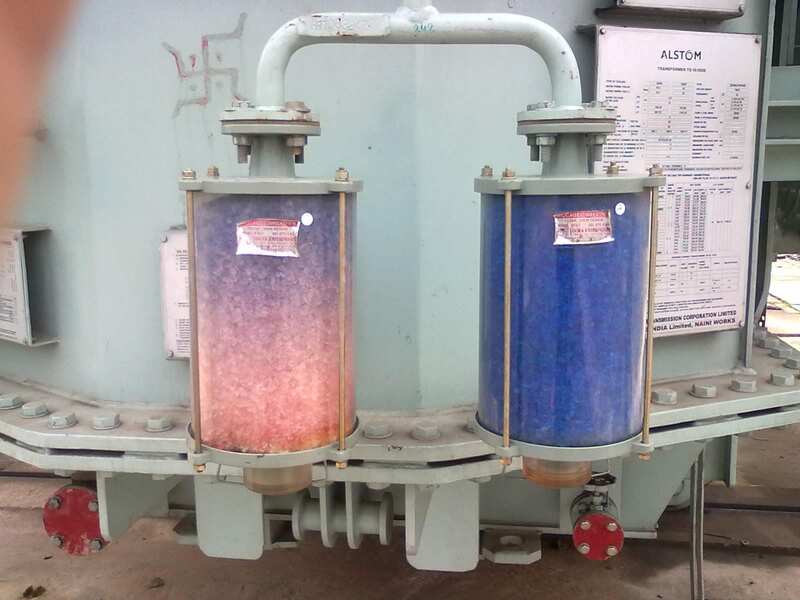 Whenever there is a minor fault or low level of oil, the bell alarm operated by float ‘A’ and whenever there is severe fault in the transformer, float ‘B’ operated due to excessive gases. It trips the circuit breaker and transformer is put out of circuit. A major fault inside the transformer causes instantaneous vaporization of oil, leading to extremely rapid buildup of gaseous pressure. If this pressure is not released with in few milliseconds, the transformer tank can rupture, spilling oil over a wide area. 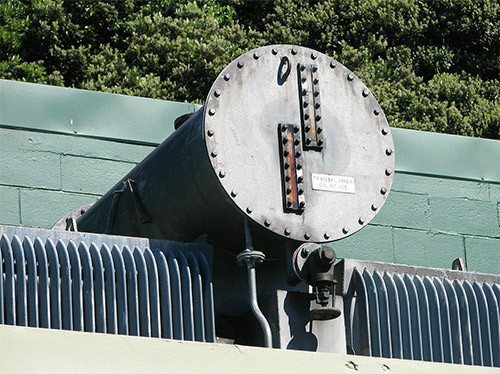 An explosion vent provides instantaneous releasing of such dangerous pressure and protects the transformer. It indicates level of transformer oil at the conservator of the transformer. It has markings on transparent sheet for maximum and minimum levels. It provides passage to pour the transformer oil in the tank during purification or in case of shortage found in the tank. It provides passage to drain the oil during overhauling or as and when required oil sample for testing. These tubes provide better and effective cooling of transformer oil by increasing the surface area of tank to the atmosphere. The tap changer is used to regulate the output voltage manually according to line voltage. The taps of transformer can be changed by the tape changer manually. It is provided on HV side so that the voltage on LV side feeding to the load can be maintained. Normally tap selection range is ± 15 % in steps of 2.5 %. The circuit breaker is an equipment which automatically cut off power supply of the system when any fault or short circuit occurs in the system. It detect and isolate faults within a fraction of a second thereby minimizing the damage at the point where the fault has occurred. The circuit breakers are specially designed to interrupt the very high fault currents, which may be ten or more times the normal operating currents. There are many types of circuit breakers, e.g. Oil, minimum oil, Air blast, Vacuum, SF6, etc. 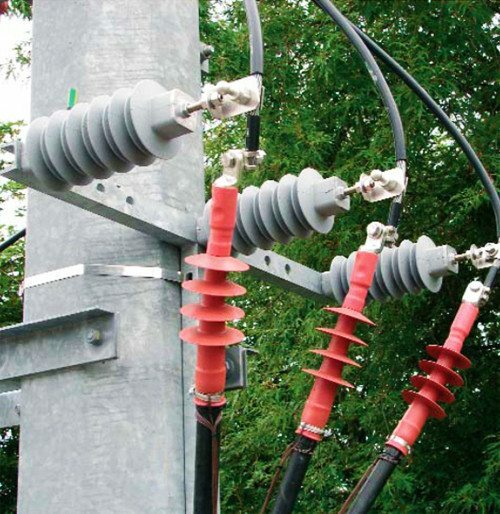 being used at distribution substations. This list is generally in order of their development and increasing fault rupturing capacity, reliability and maintainability. 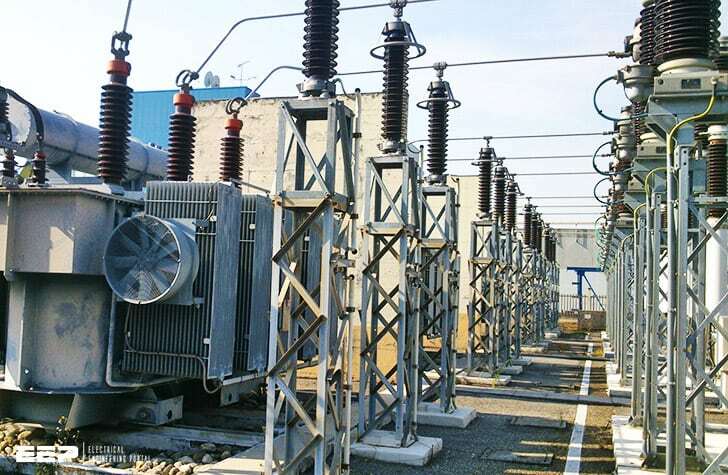 In distribution substation, generally oil circuit breakers, vacuum and air circuit breakers are used. Lightning arrester is a most important protective device of distribution substation to protect valuable equipment as well as working personnel. It arrests and discharges over voltage to earth during lightning strokes. These are installed between line and earth near equipment. Air break switches are used to isolate equipment for maintenance and also for transfer of load from one bus to another. 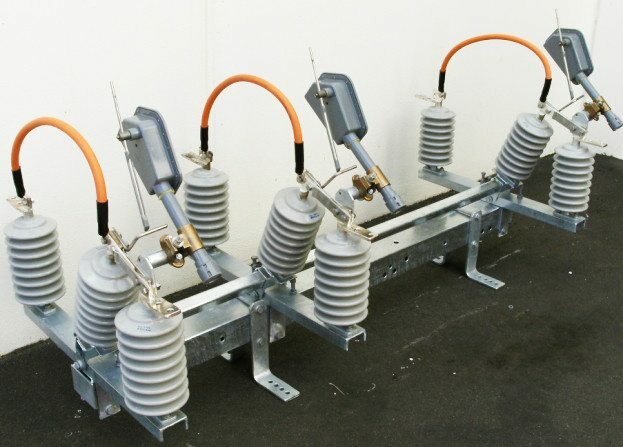 Lay-out of substation depends upon type of Air break switches. These switches are of two types viz. vertical break type or horizontal break type. Horizontal break type normally occupies more space than the vertical break type. 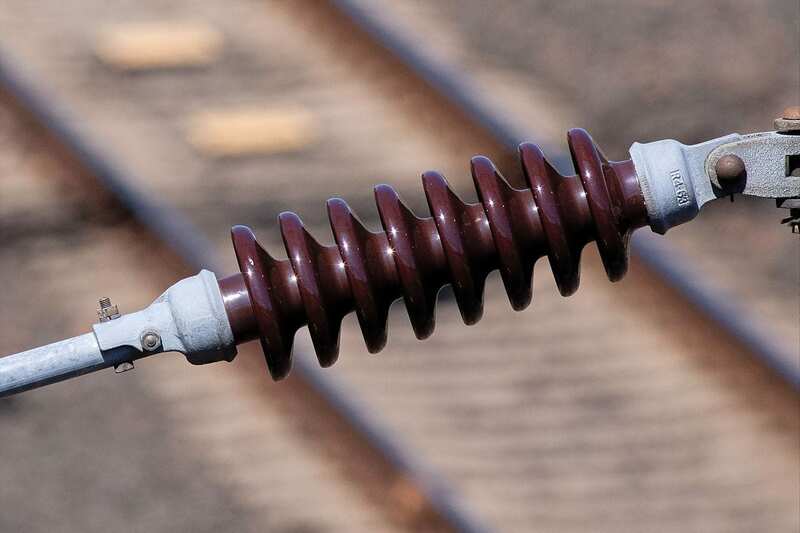 The main function of an insulator is to insulate live conductor or equipment at different voltages with reference to the ground structures as well as provide mechanical support. Provision of adequate insulation in a substation is of primary importance from the point of view of reliability of supply and safety of personnel. The busbar is a conductor used to connect two and more equipment located side-by-side when the currents are very high. These are usually rectangular, sometimes tubular, bare copper bars supported on insulators. The outdoor busbars are either of the rigid type or of the strain type. In the rigid type, pipes are used for making connections among the various equipment. The strain type busbars are an overhead system of wires strung between two supporting structures and supported strain type insulators. Since the busbars are rigid, the clearances remain constant. It is a series parallel combination of capacitors required to improve power factor of the system. They act as reactive power generators, and provide the needed reactive power to accomplish active power of circuit. This reduces the amount of reactive power, and thus total power (kVA) or the demand. The bank should be provided as near as possible to load. 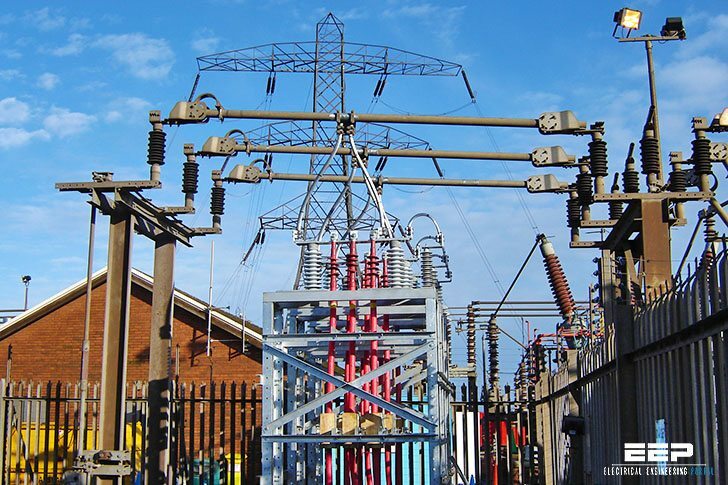 Provision of an effective, durable and a dependable earthing in a substation and switching stations is very important for the safety of operating personnel as well as electrical devices. The voltage levels do not rise above tolerable thresholds and that the earth connection is rugged to dissipate the fault to the earth. Earthing has a very low resistance and connects the electrical equipment to the general mass of the earth. Recommendations for earthing of various equipment in substation is described in this technical article. Fencing is provided at outdoor substation yard for restricting entry of unauthorized person and livestock. It must be earthed/ grounded separately. Height of fencing normally should not be less than 1.8 metres. Fencing should be painted once in a year by suitable paint. Distribution panelboard consists of MCCBs, control equipment, meters and relays are housed in the control room. The panel frame shall be connected to the earth grid by an earthing conductor. A rubber mat of prescribed size and quality shall lay in front of panel. I have seen a 2.5MVA power transformer recently which has no conservator and no Buchholz relay, but has certain sensors. What do you make of this and what is your take on such a design? what are the things required to make a best 6.6 KV indoor substation. This is a very informative and educational article on substations. Thanks for taking time to write it. Let’s not forget that none of the protection circuits will work without a battery. Sadly, it’s frequently ignored and more than one substation has burned to the ground because it was not being maintained. If you’d like a short article on the topic I’d be happy to contribute. Best regards. Voltage should be 10^8 volts (100MV) – if it were really 10^-8 V (ten nanovolts) lightning would hardly be a problem! Duration should be 10^-5s (10 microseconds); we should be rather thankful it’s not 10^5 sec. (i.e. lasting all day)! Power should therefore be (2×10^8) x (2×10^4) = 4×10^12W (or 4×10^9kW) – though this would certainly be an extreme case. I will look e to work with you sir. But I am also a graduate, I have Bsc computer science.